British rock band The Babys played what would be their last concert together 37 years ago. At a certain point, and most certainly after three decades, one just has to accept that a band is dead and gone. That is, except when it comes to a band like The Babys. Original members Wally Stocker (guitar) and Tony Brock (drums) showed us three years ago that the band never really died in the first place with the release of I’ll Have Some of That signaling a booming reunion of Britain’s premiere group of musical “infants.” Although, if you’ve ever seen them play, you’d know the name is more ironic than anything. While the band definitely has their softer moments, their shows are famous for rocking and shredding your mind and body into exhaustion. After splitting up in 1980, leaving a number of successful singles such as “Isn’t It Time” and “Everytime I Think Of You” in their wake, each member went on to play in other groups. 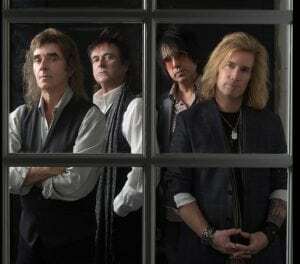 Stocker and Brock found themselves playing with the likes of Rod Stewart, Elton John, and Air Supply for several years, while bassist/vocalist John Waite ended up establishing a fairly successful solo career. Whichever the case, it is clear that music never left their lives. So that it seems only natural that The Babys would return in some form or another. Sitting down to speak about the band that won’t die, and the music that lives on, Stocker was kind enough to share his thoughts in a recent interview with Concert Guide Live. It began, perhaps unavoidably, with the topic of The Babys’ return to music. The idea, it turns out, had been “bouncing around” for years between him and Brock. 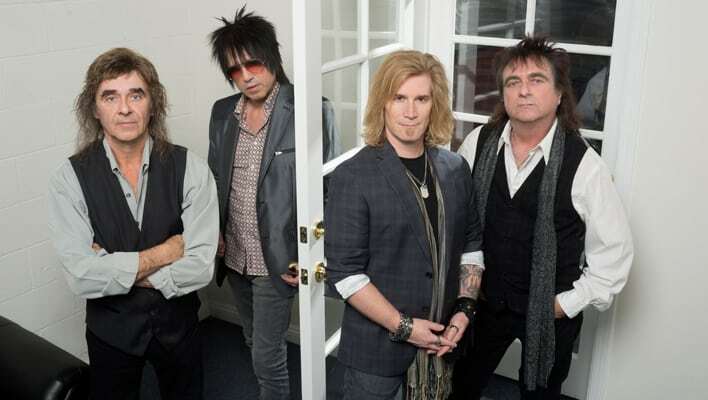 And John Waite (vocals/bass) had been onboard from the beginning, the reunion would have happened much sooner. He explained this not with any hard feelings, mind you, but with a calm understanding. “He had his own thing going on,” says Stocker. But what really struck me about the whole story was the bond between Brock and Stocker. “He’s been one of my best friends for over 40 years,” says Stocker as he describes how they would often meet up to hang out and play music over the years. This undeniable musical and personal connection was the foundation upon which the band’s reformation would take place. After finding a replacement for Waite in the skills and passion of John Bisaha, and an additional guitarist by the name of Joey Sykes, the two were ready to bring The Babys back to life. As he talked of being back in the studio, I likened the experience to slipping into an old pair of shoes. To which he happily responded, “absolutely,” all but making audible the smile on his face. Although, in spite of this metaphorical footwear, the recording process of their latest album could not escape from certain shades of the unfamiliar. Unlike the good ol’ days, where the band could write at their leisure, this time around came with a deadline of eight weeks. When converted to studio minutes, which accounts for the temporal consequences of entering the timeless, selfless state in which music is written, this really becomes not a whole lot of time. But Stocker explained with a quiet confidence that the band was “able to put it on the back burner” throughout the recording process. In fact, the focus required to meet this deadline ended up enhancing the performance of the band. As Stocker puts it, “we were all kind of at our best,” as they clocked in up to 16 hours a day of studio time. Being able to sit down and do anything for that many hours is not easy. And so I listened to this story with reverence for their passion and professionalism, in silent awe at the pure musical force that the band represents. Especially considering how “each member is a songwriter.” Amongst all four of them, “there were about 35 songs that [were] whittled down to about 18 or so.” From there, the guys picked 12 to flesh out and turn into finished pieces. These songs by no means were picked at random; Stocker was quite clear about the vision behind the album that these songs would become. He felt as though they had an “identity” to uphold, a duty to “pick up where [they] left off.” He and Brock had no intentions of letting the date on a calendar influence their music, no desire to come out “sounding completely new.” In other words, they were going to stay true to their roots, both for themselves but also for the fans. That is because The Babys love their fans. When asked about his feelings towards performing live, Stocker speaks with a fond reverence as he describes “looking up to see the audience smiling” while on stage. “That’s what it’s all about,” he says, “opening up that connection.” And that is said in regards to no setting in particular. For the venues the band play today are quite different from the ones back in their heyday. As an opening band for a slew of big names back in the late 70’s, “[The Babys] were playing stadium shows every night.” Nowadays, they find themselves playing inside actual rooms, a contrast which may seem discouraging to some. But Stocker and Co. are not concerned with basking in the glory of a stadium rock show. Even when that’s exactly what they were doing, I get the sense that it was never really about that; it was always about the music. In fact, he outright says, “I would be dead without music.” He describes it as though it flows through his veins, more essential to his health than his own blood. This, my dear readers, is what a true musician sounds like. And I have no doubt that his bandmates share the same musical vigor. Do yourself a favor and experience it in person. They’ll be stopping by The Coach House Apr 29. Tickets are still available, so don’t miss out!